I had the day off today. Dave took a couple of days off work so I decided, in order to get some extra sleep and help fight this cold that is creeping up on me I would take today off and try to take it easy and get as much sleep as possible. After a nice sleep in we went in to Windsor to Simon's Cafe, my fav cafe, for some brunch that ended up being a late lunch! It was really busy! Afterwards we grabbed a coffee and wandered through Windsor while sipping away and then headed to St.Matthews Anglican Church, which also has a graveyard, and we wandered around for a bit, checking out the gravestones. It sounds a bit morbid, but it was really quite fascinating and something we've been meaning to do for a while. The church was constructed in 1817 and was designed by Francis Greenway. The graveyard dates back even further than the church, with the first tombstone being laid in 1810. There are quite a few graves of people who arrived in Australia on the First Fleet and it's really interesting to walk around and see just how old some of the graves are. I took quite a few photos, but I thought this one might be ok for the Numbers PUSH photography theme over at Hello Owl this week. 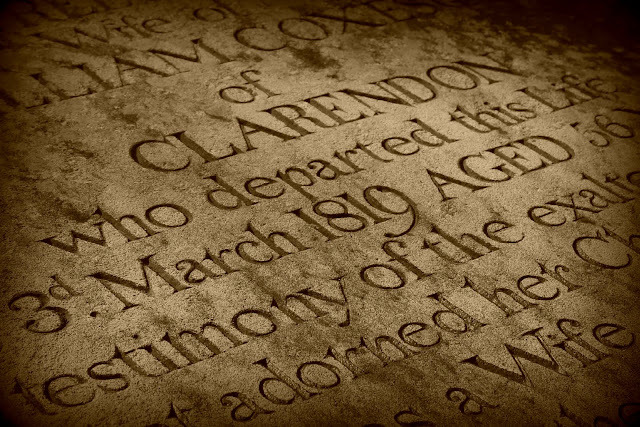 In this picture is of the tomb of Rebecca Cox, who was born in 1763 and died in 1819. I don't know if she arrived with the First Fleet, there was no plaque to say when she arrived, but it's kind of mind-blowing to look at something like this and imagine what life must have been like back then, just how different it would have been. Thats a great photo and i dont think you're too morbid - i used to cut through the cemetery on my walk to school and would read some of the headstones on my way through, wondering who the people were and what their lives were like... most other kids just took the road around because the cemetery was too creepy, especially on winter mornings when it was still foggy!